For more than 30 years, internationally acclaimed wreck diver and best-selling author, Rod Macdonald, has surveyed and researched shipwrecks around the world. His books such as Dive Scapa Flow and The Darkness Below are household names in the diving world. 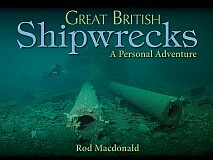 In Great British Shipwrecks Rod uses his encyclopaedic knowledge and an intimate understanding of shipwrecks, gleaned from a lifetime’s diving, to provide a snapshot in time of some of the best known and most revered shipwrecks around the UK. For each of the 37 shipwrecks covered Rod provides a dramatic account of its time afloat and its eventual sinking – with each wreck being beautifully illustrated by renowned marine artist Rob Ward. Rod’s journey around the UK starts with the classic recreational diving shipwrecks at Scapa Flow in the Orkney Islands from giants such as the German WWI battleships, Markgraf, König and Kronprinz Wilhelm, to the legendary WWI British cruiser HMS Hampshire on which Lord Kitchener perished on a voyage to Russia in 1916. Rod then travels to the English Channel where he covers such famous ships as the P&O liners Moldavia and Salsette which were lost during WWI with many others such as the SS Kyarra and the British submarine HMS/M M2 – the first submarine to carry a seaplane for reconnaissance. The reader is then taken to the North Channel of the Irish Sea where the famous technical diving wrecks of the White Star liner Justicia, HMS Audacious, the first British battleship lost during WWI, and the SS Empire Heritage, which was lost with its deck cargo of Sherman tanks on a voyage from New York during WWII, are beautifully illustrated. Returning to Scotland, the famous West Coast shipwrecks such as the Thesis, Hispania, Rondo and Shuna in the Sound of Mull grace the pages, in addition to the renowned wrecks of the SS Breda, lost near Oban, and the WWII minelayer HMS Port Napier off Skye. Lastly, Rod covers some major North Sea shipwrecks, revealing for the first time the haunting remains of HMS Pathfinder, the first Royal Navy warship to be sunk by U-boat torpedo during WWI. This is a beautifully illustrated and definitive guide to the greatest shipwrecks around the UK and will be an enlightening and unmissable book for many. This book is an essential ‘must have’ for divers and anyone interested in what lies beneath Britain’s seas. UK divers will find many wrecks they have personally dived plus many others still on their ‘to do’ list. A visually stunning book for all those interested in maritime/military history and non-divers who will marvel at sights hidden from view in the dark depths of Britain’s waters.